When people bring reusable bags to the grocery store — and actually remember to take them in from the car — they are more likely to take another environmentally-friendly step and buy more organic products than they might otherwise have. Then, feeling good about themselves, they treat themselves to indulgences like cookies, ice cream or potato chips, a new study in The Journal of Marketing found. The findings come from researchers at Harvard Business School and Duke University’s Fuqua School of Business who analyzed more than twomillion trips to a California supermarket and conducted experiments to determine whether the act of bringing reusable bags actually changed consumer behavior. They concluded that it did. The researchers attribute the changes to two distinct, largely unconscious processes. 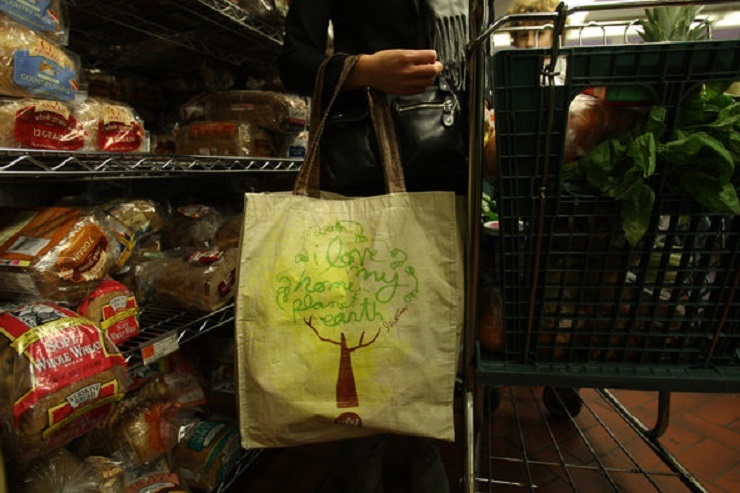 The first, called the priming effect, comes into play when you bring reusable bags and then “behave in a congruent fashion, and buy environmentally friendly products,” said Bryan Bollinger, a study co-author and assistant professor at Duke. Many of us are probably more familiar with the other effect, called the licensing effect. “Previous research suggests that making a virtuous decision in one domain allows you to make an indulgence in a different domain” — like when you have dessert because you just went to the gym, said Uma R. Karmarkar, another study author and an assistant professor at Harvard.